In honour of 'The Birthday Boy', I am writing in orange... not my favourite colour, but one of his :-)! It was Mr.C's birthday on Saturday - again, I am rather late with the actual post... but better late than never right?!? We are learning that opening presents with a toddler around is quite different to opening them when she was too little to understand! I remember watching my sis-in-law and niece last Christmas - Sienna wanted to open EVERYONE'S presents... it was cute, but! Sharlene was fantastic - making sure she didn't open everyone's gifts, but did allow her to open Mummy's gifts; I think this is something we will need to be aware of this Christmas! There is 13 months between Sienna and Button - so she'll be, this year, where Sienna was last year... although it is hard to know where Sienna will be at as we won't see them on Christmas Day this year! Top Left - Family photos framed from my brother and sis-in-law... a big hit with the hubby and daughter! Top Right - Button getting excited over the card from Nana and Granddad (Luke's parents) as it has a dog and a cat on it! 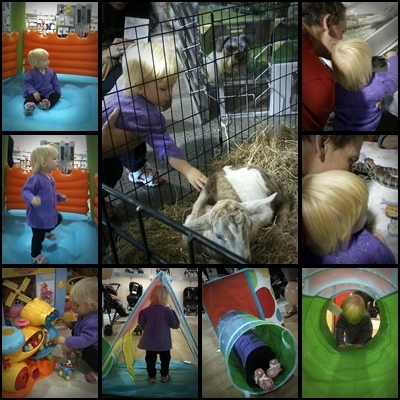 She is obsessed with animals! Bottom Left - 'Man-Crush'! Mr.C thinks SBW (Sonny Bill Williams for those not in the know... a NZ All Black) is the best think since sliced bread, so my parents bought him his book! 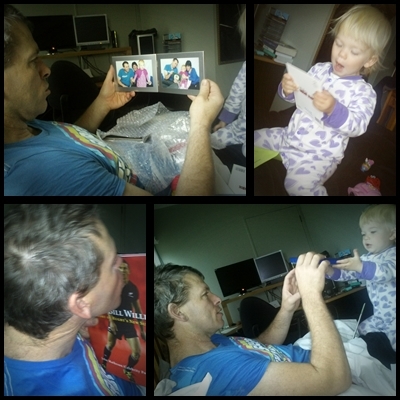 Bottom Right - Button and Mr.C posing for the third time; Button giving Daddy his birthday gift from her! I did start to wonder whose birthday it was... but as the saying goes 'When Button is happy, Mr.C is happy' (at least that is what he quoted to me *grin*)! The day finished off with home-made pizza for dinner cooked by Rowie, and shared with them and Sam & Laura from next door! Mr. C had a lovely day - even if it was different than what we'd planned or what he is used to *grin*! For his birthday treat from me, we'll be going out to see 'Mission Impossible' next week by ourselves... his choice! Now that is really pushing the birthday out :-) Glad he enjoyed it!